HYDE, Pa. – Scoring all of its points in the first half, Clearfield completed its first unbeaten regular season since 2013 with a 49-0 win over visiting Bishop Carroll. It is the ninth unbeaten regular season in school history and the eighth time the Bison (10-0 overall, 8-0 Mountain League) have gone through a regular season without a loss or a tie – they tied St. Marys in 1939. Seven of those seasons have come under 34th-year head coach Tim Janocko, who won his 273rd career game Friday night. Caleb Freeland scored three times in the victory Friday night scoring twice on the ground while rushing five times for 22 yards and also catching a 56-yard touchdown pass from Isaac Rumery. Taye Lynch added a pair of touchdowns including catching a 42-yard touchdown pass from Rumery and recovering an offensive fumble by Ryan Lezzer in the end zone for a touchdown. That came at the end of a 42-yard pass from Rumery to Lezzer that saw Lezzer fumble as he was going into the end zone. By rule, Lynch is credited with a receiving touchdown on the play and Lezzer a touchdown pass. Rumery was 5 of 7 passing for 187 yards and three touchdowns. Clearfield also scored a pair of defensive touchdowns with Ryan Lazauskas returned a fumble 35 yards for a score and Oliver Billotte picking off a pass and returning it 90 yards for a touchdown as the end of the first half. Unbeaten regular seasons for the Bison include 1939 (with the tie), 1955, 1994, 1998, 2004, 2010, 2012, 2013 and 2018. Bishop Carroll ends its first season in the Mountain League 2-8 overall and 1-7 in league play. 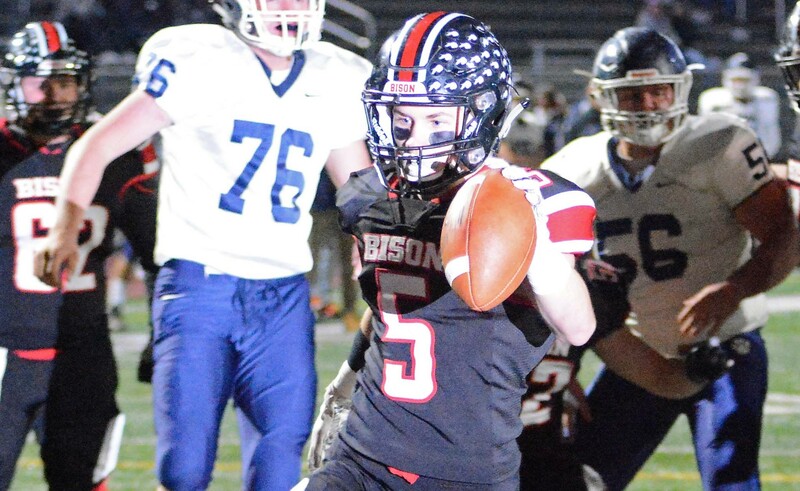 DUBOIS, Pa. – Dylan McCluskey hit three field goals as DuBois earned a trip to the District 6-9 Class 4A playoffs with a 16-7 win over visiting Brookville. Prior to the game, DuBois (4-6) decided it must beat the Raiders (6-4) to advance to the postseason. The Beavers did just that by building a 10-0 lead at halftime and a 13-0 lead midway through the third quarter thanks in large part to McCluskey’s leg. The senior, who came into the contest with four field goals hit a 29-yard field goal in the first half to put DuBois up 10-0 and then connected on a 26-yard kick in the third quarter to make it 13-0. Eric Schneider had given the Beavers a 7-0 lead on a 4-yard touchdown run. Brookville, which was held to its fewest points since former DuBois head coach Frank Varischetti took over as offensive coordinator before last season and was coming off a win over previously unbeaten Ridgway, tried to make it a game when it turned a Beavers fumble into a 15-yard Robert Keth to Cabe Park touchdown pass late in in the third quarter to cut the DuBois lead to 13-7. But McCluskey gave DuBois some breathing room with a 30-yard field three minutes into the fourth quarter, and the Beavers defense did the rest. Schneider ran all over the Raiders defense rushing 33 times for 226 yards and the touchdown. McCluskey added 81 yards on 12 carries. Schneider was also 2 of 11 passing for 18 yards and an interception. Coy Donahue had two picks on defense for DuBois as well. Keth was 13 of 34 passing for 110 yards, a touchdown and two picks. Ian Thrush had three catches for 66 yards. The seven points were the fewest for Brookville, which lost 10 yards rushing on the night, since being shutout, 35-0, Oct. 21, 2016, vs. St. Marys. C-L with the Black & Blue Brawl Trophy for the first time. The Lions beat Clarion for the first time since 2004. CLARION, Pa. – Behind another monster game from Austin Newcomb, Clarion-Limestone broke a 15-game losing streak to rival Clarion while beating the Bobcats for the first time since 2004, 62-28. Despite not playing the final nine minutes of the game on offense because of the score, Newcomb, who was coming off a 416-yard rushing performance in last week’s win over Curwensville, ran for 374 yards and six touchdowns on 30 carries and added a catch for 42 yards and score giving him back-to-back games of 400 offensive yards. Newcomb scored on runs of 3, 14, 3, 49, 15 and 74 yards and caught the 42-yard pass from Colby Himes, Himes’ only completion of the game. The 374 yards on the ground put the C-L junior over 2,000 yards on the season with 2,172. He has scored 28 rushing touchdowns. Newcomb has also caught 23 passes for 553 yards and five scores and has scored a total of 36 touchdowns on the season. Ayden Wiles added a pair of rushing touchdowns for the Lions (8-2) and finished with 13 carries for 62 yards leaving him just 21 yards shy of 1,000 on the year. The C-L seniors talked about the victory. The game was a shootout from the start with C-L scoring twice in the first 1:55 to take a 14-0 lead before Clarion (6-4) made it 14-7 with 9:52 to go in the first quarter meaning 21 points were scored in the game’s first 2:08. The scoring never really stopped in the first half with C-L, which racked up 554 yards of total offense, leading 36-22 at halftime. Clarion, which had 371 yards of offense of its own, got a pair of touchdown catches from Sam Minich and a touchdown run apiece from Logan Minich and Archer Mills. Mills also threw a touchdown pass and was 12 of 17 passing for 111 yards, a touchdown and an interception while rushing for 76 yards on 10 carries. Sam Minich had seven catches for 123 yards, while Logan Minich added nine carries for 74 yards and three catches for 21 yards. Cal German also threw a touchdown pass and was 2 of 4 passing for 54 yards with an interception. The 62 points are the most ever scored in the series, which was played for the 48th time on the field, by the Lions, while the 90 combined points were also the most ever in the series. WESTFIELD, Pa. – Colton Geitler and Chris Connelly combined for 241 yards rushing and three touchdowns, as visiting Otto-Eldred held off winless Cowanesque Valley for a 28-24 win that most likely earns the Terrors a District 9 Class 1A playoff berth. Geitler ran 28 times for 139 yards and two scores with Connelly adding 12 carries for 102 yards and a touchdown. Cole Sebastian also scored on the ground for the Terrors (5-5) and had 38 yards rushing while going 7 of 13 passing for 118 yards and an interception. The game was tied at 8-8 at halftime before Otto-Eldred scored twice in the third quarter on runs by Sebastian and Connelly to take a 22-8 lead. But Cowanesque Valley (0-10) scored 6-yard Matt Barber run in the fourth quarter to close the gap to 22-16. Geitler’s 1-yard touchdown run restored the double-digit lead at 28-16 with 1:49 left to play, but Seth Huyler scored on a 3-yard run with 1:08 to go to make it interesting. The Indians then recovered the onside kick giving them the ball at midfield and moved to the Otto-Eldred 27-yard line before Chase Sebastian picked off a Huyler pass at the 5-yard line to seal the victory. CURWENSVILLE, Pa. – Behind three Jon Wood touchdowns, visiting Brockway beat Curwensville, 24-14. Wood, who ran 18 times for 112 yards and added six catches for 70 yards, scored on runs of 12 and 13 yards and a caught an 11-yard pass from Peter Downer. Zane Puhala also kicked a 21-yard field goal for the Rovers (8-2). Downer was 10 of 16 passing for 116 yards, the touchdown and two interceptions while running 15 times for 31 yards. Cole Bressler (1-yard run) and Blake Passarelli (20-yard run) scored for Curwensville (6-4), which drops to the fifth seed in the District 9 Class 1A playoffs with the loss. The Passarelli run with 8:46 to play got Curwensville within a touchdown, 21-14, but Puhala’s field goal with 3:47 left gave the Rovers, who will be the No. 2 seed in the District 9 Class 2A postseason, some breathing room. Passarelli ran 13 times for 76 yards with Bressler adding 12 carries for 71 yards. Connor Ford had both interceptions for Brockway, while Bressler and Dakota Bloom each had a pick for Curwensville. NEW BETHLEHEM, Pa. – Hunter Wiles ran 19 times for 207 yards and three touchdowns to lead Redbank Valley to a 54-27 win over visiting Punxsutawney. Behind Wiles, the Bulldogs (7-3) racked up 654 yards of total offense, including 536 on the ground. Hunter Buzard also went over 100 yards rushing with six carries for 141 yards and three scores while also picking off a pass on defense. Travis Crawford chipped in a touchdown run for Redbank Valley and just missed a 100-yard game with 97 yards on eight carries, while Keaton Kahle tossed a 43-yard touchdown pass to Ethan Hetrick. Kahle was 6 of 7 passing for 118 yards and the score with Hetrick catching four passes for 98 yards and the touchdown. Buzard added a catch for 20 yards. Max London scored three times for Punxsutawney (2-8). He caught a 41-yard scoring pass from Dylan Ishman, ran for a 5-yard score and returned a kickoff 80 yards for a touchdown. London had four catches for 102 yards and eight yards rushing on seven carries. Ishman also threw an 11-yard touchdown pass to Carter Newcome and was 11 of 23 passing for 192 yards, two touchdowns and two interceptions. Newcome had four catches for 54 yards. Alex Gianvito added 100 yards rushing on 15 carries and caught two passes for 33 yards for the Chucks. JOHNSONBURG, Pa. – Ridgway won a defensive slugfest with visiting Union/A-C Valley at Johnsonburg, 21-7. Gabe Watts (2-yard run), Jake Wickett (62-yard punt return) and Issac Scholder (14-yard pass from Paul Gresco) scored for the Elkers (9-1), who secured the top seed in the District 9 Class 2A playoffs with the victory. Jonathan Powell scored on the ground for Union/A-C Valley (4-6). Gresco was 7 of 12 passing for 76 yards, the touchdown and two picks for Ridgway, while Watts had 13 carries for 71 yards and the touchdown. Powell ran seven times for 49 yards and the score for Union/A-C Valley, while Colton Hoffman had two catches for 44 yards. Hoffman also made eight tackles and forced a fumble. BRADFORD, Pa. – Christian Cole ran 33 times for 238 yards and five touchdowns to help visiting Oil City tuneup for the District 10 Class 5A championship game next week with a 40-0 thumping of Bradford. Cole, who is now unofficially 34 yards shy of the District 10 single-season rushing record of 2,934 yards set by Lakeview’s Blake Reddick in 2013, scored on runs of 7, 1, 80, 10 and 12 yards while helping the Oilers (9-1) rack up 391 yards on the ground. Oil City also scored on a 32-yard Sean Stack interception return for a touchdown. Bradford was limited to 126 yards of total offense led by Donny Pattison’s 13 carries for 56 yards. It was the first time the Owls (6-4) had been shutout in 24 games since Kane blanked them 41-0 Oct. 7, 2016. It marked the second shutout of the season for Oil City, which also blanked Warren, 38-0, Sept. 28. Oil City will face General McLane, who beat the Oilers 17-12 Sept. 14, in the District 10 title game Friday, Nov. 2, at Edinboro University. Bradford will host Bellefonte in the District 6-9 Class 4A playoffs next week. WEST SUNBURY, Pa. – Moniteau ran for 326 yards and five touchdowns on its way to a 36-12 win over visiting Keystone. Martino also had a team-leading eight tackles while Dessicino, Wise and Trent Kelly had interceptions. Isaak Jones threw a 14-yard touchdown pass to Hunter Langharst and Jayden Blazosky scored on a 23-yard run for Keystone (3-7). Jones was 5 of 22 passing for 65 yards, the touchdown and three picks while rushing for 11 yards. Blazosky had three rushes for 35 yards and two catches for 22 yards. TITUSVILLE, Pa. – Anthony Kamenski threw a pair of touchdown passes to Erik Pfeiffer and also ran for a score as Karns City closed out its season with a 34-12 win at Titusville. Kamenski was 4 of 9 passing for 29 yards, the two scores and an interception and added seven carries for 12 yards and a touchdown. Pfeiffer had two catches for 15 yards. Mitchell Kelsea added a touchdown run for the Gremlins, while Dalton Pyle returned a kickoff 89 yards for a touchdown. Hunter Jones led Karns City’s offense with 15 carries for 86 yards. Landon Palma scored twice for Titusville returning a kickoff 90 yards for a touchdown and catching a 37-yard pass from Boaz LaRocque. The game featured back-to-back kickoff returns for scores. After Pfeiffer caught an 8-yard touchdown pass from Kamenski to put Karns City (4-6) ahead 7-0 with 6:11 left in the first quarter, Palma returned the ensuing kickoff the 90 yards to cut the Gremlins lead to 7-6. But Pyle answered with his 80-yard kickoff return for a touchdown to put Karns City ahead 14-6. WARREN, Pa. – Jake Kupchella threw a pair of touchdown passes and ran for a third to lead Warren to a 39-0 win over visiting St. Marys. Kupchella ran three times for 85 yards scoring on an 18-yard run and was 12 of 26 passing for 187 yards and the two scores while throwing an interception. He threw scoring passes of 25 yards and 35 yards to Micah Passmore. Passmore had three catches for 58 yards. Aidan Morrison added a 71-yard interception return for a score for the Dragons while Marvin Bryant, who ran for exactly 100 yards, scored on a 36-yard run. Sawyer Mohney also hit a 25-yard field goal. Jackson McClain led St. Marys (0-10), which has lost 21 straight games and finished winless for the second straight year, with nine carries for 62 yards. According to the Warren Times-Observer’s Andy Close, the game was the final one for St. Marys’ head coach Tony Defillippi, who said he was resigning after the game.